Tours include sailing past iconic sights such as Alcatraz Island, the San Francisco City Front, AT&T Park, and under the Golden Gate Bridge or the Bay Bridge. You will also experience lesser known destinations such as Paradise Cove, Treasure Island, and Angel Island. With a skilled Captain aboard, you will be encouraged to take the helm yourself or you can just sit back and enjoy the scenery. Skippered Sails are a minimum of three hours long and can be customized to fit your schedule and specific goals for the day. With a fleet of 22 yachts, including two catamarans, we can accommodate the size of your group. While you don't need a special reason to enjoy a day on the bay, it can be great option for family reunions, birthday parties, and team building events. No matter if you are a seasoned sailor or a novice, a Skippered Sail is a great way to enjoy sailing in San Francisco. Skippered sails are a great option for 1- 6 people and private events. 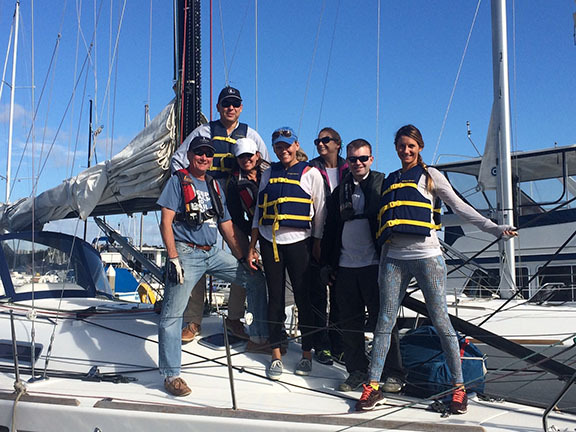 For large, team building events, a Corporate Regatta Challenge is a good fit for you. Learn more about the boats in our fleet here and view Skippered Sail packages and rates here. Do you have questions? Would you like to book a Skippered Sail? We would love to help you! Email us at office@modernsailing.com or give us a call at (415) 331-8250.